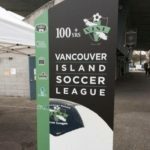 The top flight of the Vancouver Island Soccer League was back in action and open for business this past weekend, and there were some surprises you could say. 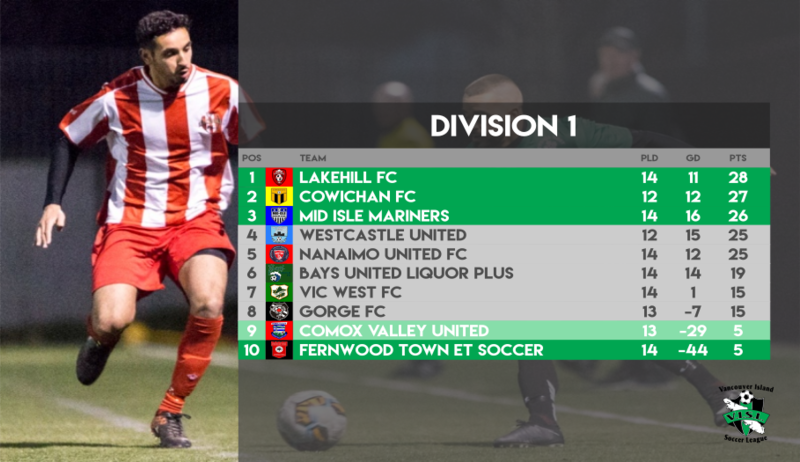 The standings have changed, and the outlook on the year has become murky at best, with defending champions Cowichan FC launching a significant late push to make it an incredible fivepeat. Here is the quick breakdown of what happened in Week 14’s action. Gorge FC slipped by Vic West 2-1 at Hampton on Friday night, with goals by Mike Moon and Anton Bucher. Vic West got their lone marker by Rookie of The Year candidate, and former Whitecaps Residency player, Nicholas Budisa. In a battle between two of the top title contenders, Cowichan FC nipped by Mid Isle Mariners by a 2-1 scoreline. Jordon Korven and Craig Gorman were on the scoresheet for Cowichan, while James Taylor got the lone marker for Mid Isle. That win moved Cowichan into second place in the standings, one point behind the leaders but with two games in hand. 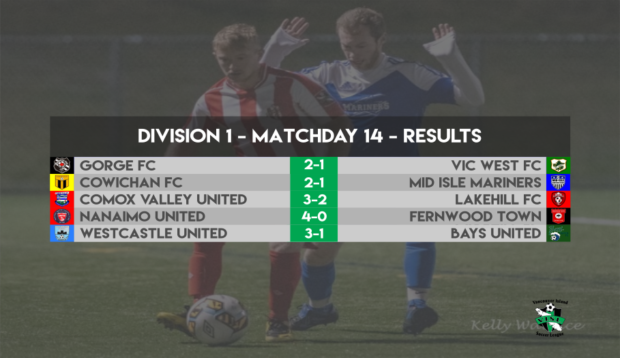 And those standings are in part due to the biggest shock of the weekend, which saw last placed Comox Valley United defeat the league leading Lakehill FC 3-2 thanks to a pair of goals from Grayson Chalifoux and the match winner from Joe Butcher. Nicholas Pineda-Graham and Shohei Iwamoto were on the scoresheet for Lakehill. At Merle Logan Turf, hosts Nanaimo United took down Fernwood 4-0 with goals from Matt Mehrassa, Hector Reyes-Valdez, Westlee Bischoff, and the newly acquired Andreas Algarin. Nanaimo keeper Geoff Hackett had the clean sheet. The final game of the weekend saw Westcastle defeat Bays Utd 3-1 after goals Maurizio Abdi, Goteh Ntignee, and Simon Stacey. 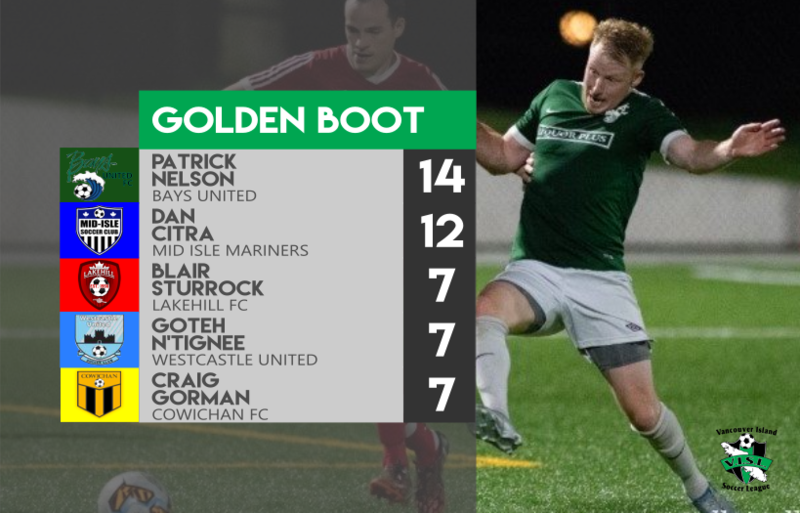 The Bays marker was by the Golden Boot leading Patrick Nelson, who put away his 14th of the season. Lakehill still remain top of the table, but their loss allows both Cowichan and Westcastle to earn valuable catch up points – especially as both teams have two games in hand. It will be an interesting game when those two face off soon, especially as one of the games is a make up game. Bays, Vic West, and Gorge are now on the outside looking in. They will need other teams to help them out in order to qualify for a Provincial Cup Berth via league standings. Comox and Fernwood remain in the relegation zone, but Comox jump into 9th with their win – via goal differential. An excellent start to 2019. Well, at least an interesting one that offered plenty of excitement. Already looking forward to what this coming week brings.